NASCO's Deluxe Child CRiSis™ Manikin features the same quality components as the Complete Child CRiSis™ Manikin with the addition of the hand-held Arrhythmia Simulator. This arrhythmia simulator includes: 17 Adult/Pediatric Rhythms; V. Fib, V. Tach (Fast), V. Tach (Slow), V. Tach (Polymorphic), Fib, Flutter, SVT, Sinus Tach, Sinus with PVCs, Asystole , NSR, Junctional Brady, Sinus Brady, 2nd degree type I A-V block, 2nd degree type II A-V block, 2nd degree type II A-V block with PVCs, 3rd degree A-V block. Generate realistic 3-lead or 4-lead ECG rhythms. The RA, LA, and LI signal morphologies create accurate representations of the QRS, P, and T axes. Waveforms available for pacing include: Sinus Brady, Junctional Brady, 2nd degree type I A-V Block, 2nd degree type II A-V block, 2nd degree type II A-V block with PVCs, 3rd degree A-V block. 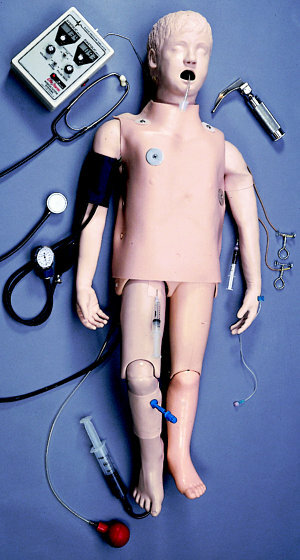 Manikin comes with a full body manikin of a 5-year-old child with Life/form® IV Training Arm, Blood Pressure Arm, Defibrillation Chest Skin, Intraosseous Infusion/Femoral Access Leg, and Airway Management Trainer. Three-year warranty.